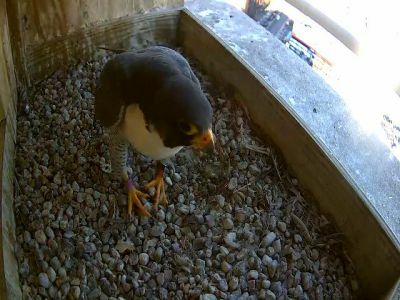 There is an international protocol in North America for colored leg bands on Peregrine Falcons, which indicates the origin or subspecies for chicks banded in the nest. This new bird has a red and black band on the left leg and a pink aluminum band on the right leg. The red/black combination tells us that the bird is from the Eastern United States. The aluminum band is the US Fish and Wildlife Service band. Now, we just need to see the band numbers and we can look up information about this male to see where and when he was banded.